Antenna Magus version 2.0 released! 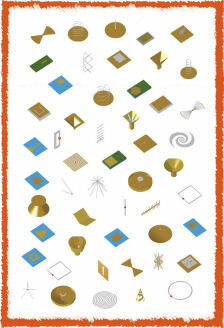 We are very proud to announce the second major release of Antenna Magus, Version 2.0. Click here to see the press release. Looking back over the past 11 months since release 1.0 the product has really grown. With 113 antennas in the database (almost double since 1.0), a new Array synthesis tool, report and data exporting, estimation speedups, support for a new simulation tool (CHAMP), more FEKO and CST Studio Suite model options and major rework on the User interface (UI) it calls for a celebration! This newsletter will focus on some of the features and give you a taste of what to expect once you have upgraded to version 2.0. The biggest new feature added to Antenna Magus since release 1.0 is the new Array synthesis tool. This tool helps with the initial stages of array design. Typically, the first step in array design is to determine the number of elements, their spacing and relative excitation. 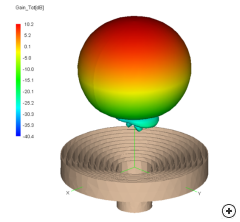 The radiation pattern of the element used in the array is usually ignored during this phase, and is substituted with an omnidirectional element. The array synthesis tool contains a number of design algorithms that will determine the required array parameters for given objectives. For example, in the image above, a circular array has been designed for a directive lobe at 45 degrees. 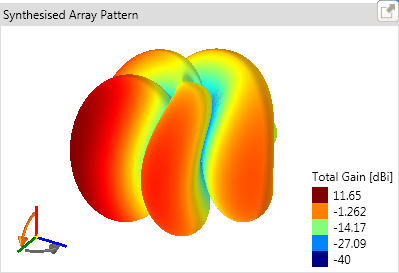 Array layouts can also be imported into Antenna Magus, for a quick analysis of their performance, using isotropic elements. The next step is to see what effect the element pattern has on the array, and to adjust the array parameters to compensate for the element pattern. The array synthesis tool contains a number of typical patterns for common array elements. The next image shows the resultant array if half wavelength dipoles are used in the layout above. The synthesized pattern, as well as the chosen element patterns and designed array distribution can be exported to tab-separated files or to impressed excitation formats that are supported by FEKO and CST Studio Suite. 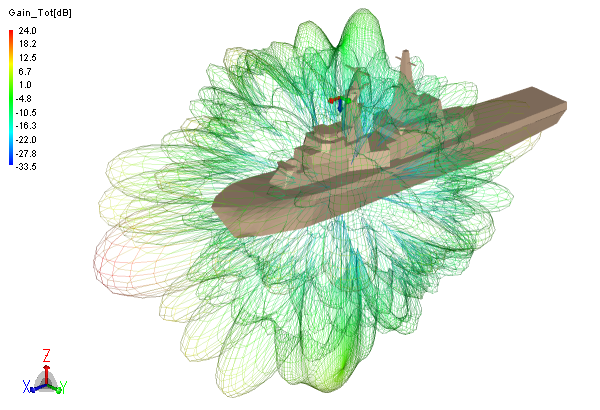 The image below shows the calculated far field of an array placed on the mast of a ship. Array point source placed on a ship. 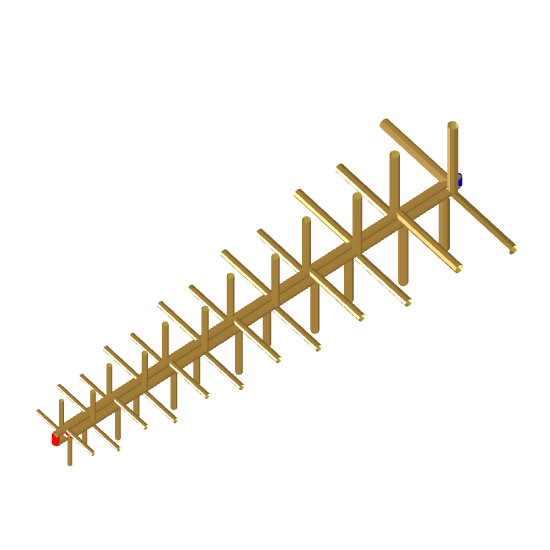 There are 6 new antenna additions to the database since the release of Antenna Magus version 1.6.0. Image of the Traveling wave slotted guide array. Compared to the Resonant waveguide slot array that is already available in Magus, the Traveling wave slotted guide array has some impressive advantages. It can handle higher power and operates over a much wider band (up to 25% bandwidth), where the resonant array suffers from a decreasing bandwidth as the number of elements (and hence gain) increases, whilst this array does not. 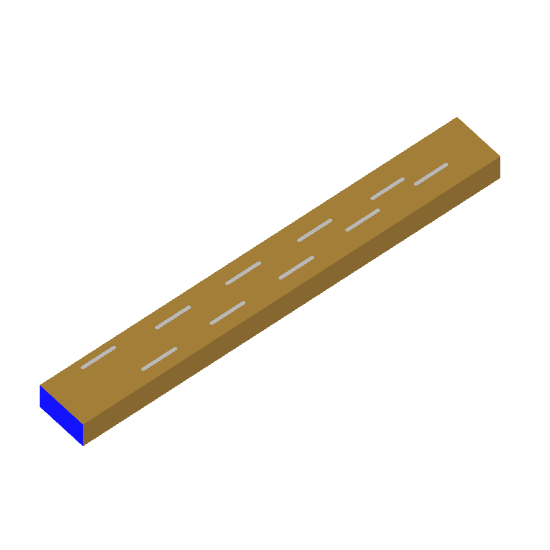 The slots of the Traveling wave slotted guide array are spaced equally on either side of the guide center. 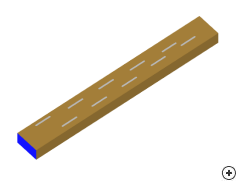 The physical distance between each of the slots determines the relative phase shift of each element in the array. 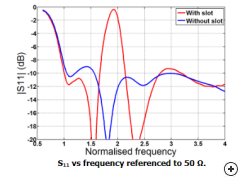 Because the physical distance is fixed, the phase shift varies across the band of operation. 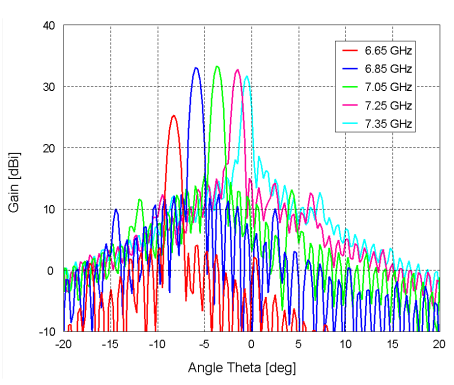 The end result of this is that the array has a squint that varies with frequency. 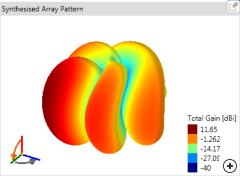 The image below shows the gain patterns of a 100 slot Traveling wave slotted guide array designed at 7 GHz with 34 dBi gain at the center frequency, simulated over a wide frequency range. Note a total of 7 degrees shift in squint angle over a 10% change in center frequency. 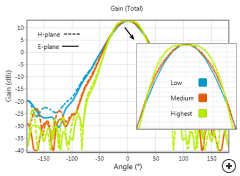 Traveling wave slotted guide array squint angle pattern shift vs frequency. 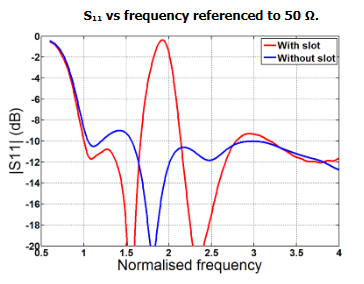 In a radar applications, this frequency dependant squint (shown in the previous image) has to be removed by processing the returned signal to avoid ghosting. Typical S11 for (a) 11-element and (b) 95 element arrays. 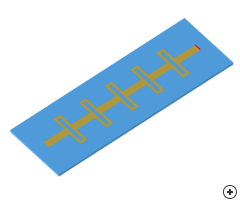 The Microstrip Franklin array effectively consists of thin rectangular half-wavelength patches which are connected with non-radiating, phase revering phasing lines. 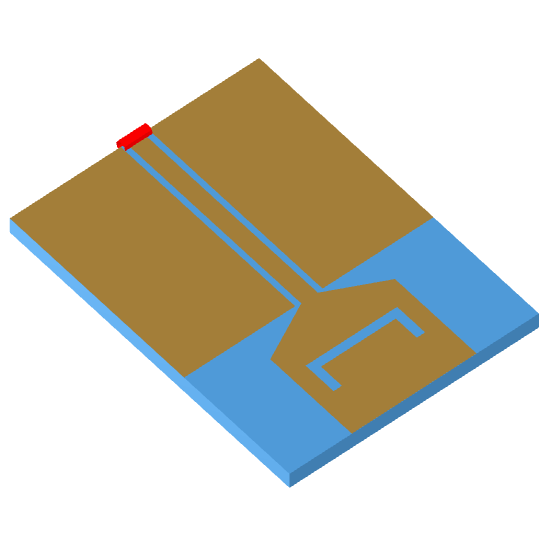 The phasing lines are narrow half-wavelength microstrip lines folded into quarter-wave stubs so that the counteracting standing wave currents do not radiate. The natural current distribution is thus converted into a co-phased distribution of currents which produce only one major radiation pattern. 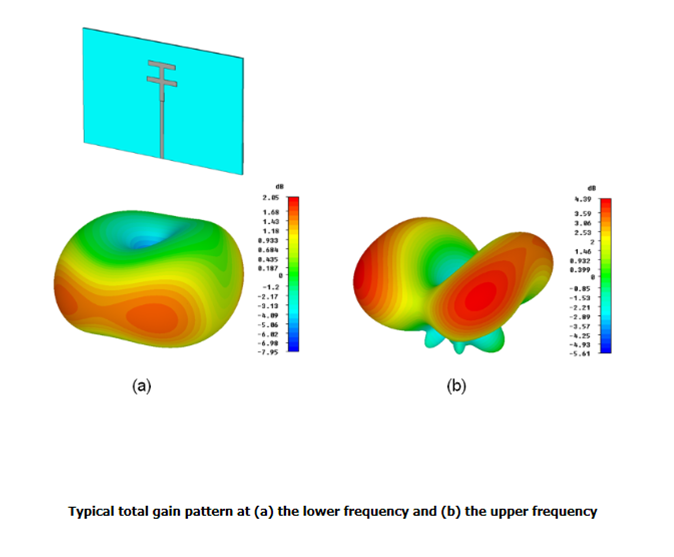 The synthesis algorithm in Antenna Magus can design this antenna for gain or number of elements, as well as designing the array on a wide variety of substrates. 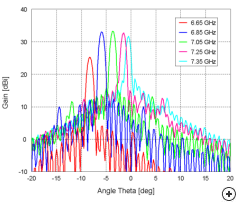 It has a narrow broadside beam with very narrow impedance bandwidth (1%) and typical gain between 7 and 20 dBi (depending on the number of elements). The advantage of the Franklin array is that it requires no feed network and is ideal for low-cost point to point communication. 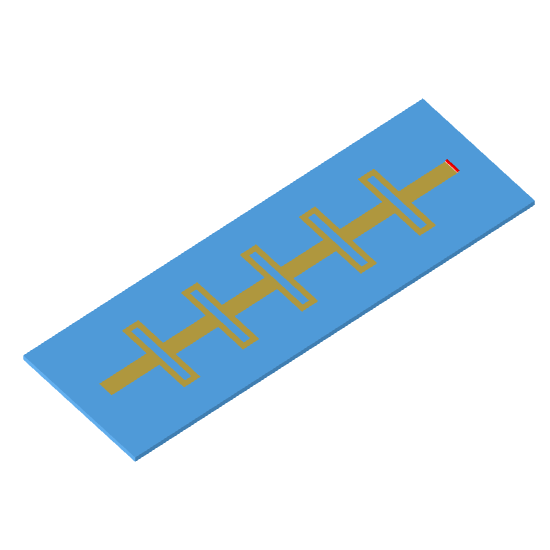 Image of the Microstrip Franklin array antenna. 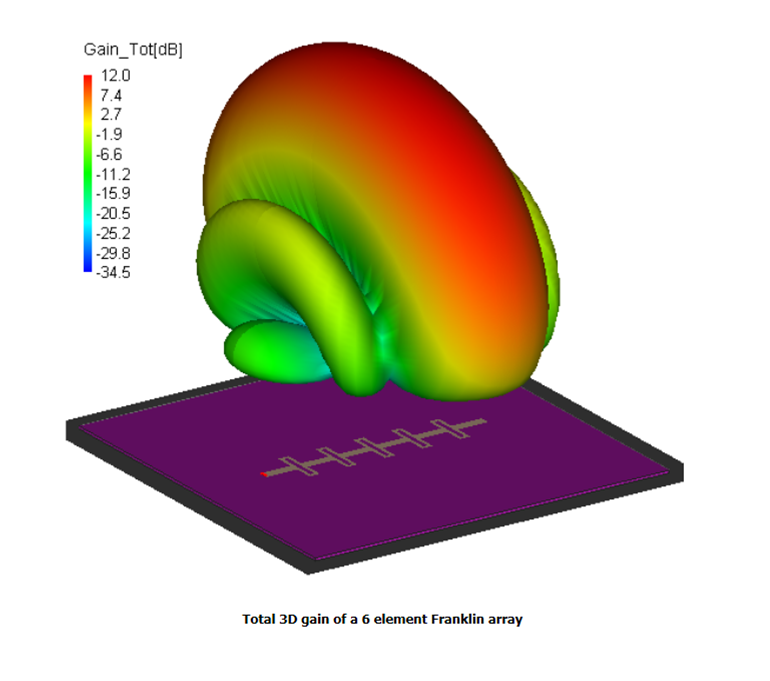 Total 3D gain of 6 element Franklin array. This antenna is a variation of a basic planar monopole antenna. An additional section is attached to excite a second resonance at a higher frequency. 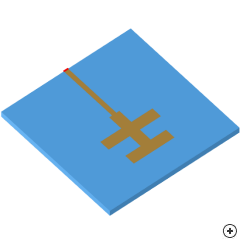 As with several other planar antennas, this monopole can be integrated on the same substrate as other electronics. The T-shape monopole makes the antenna more compact than a straight monopole. The 2D graph below shows the input impedance (S11) with dual resonance. 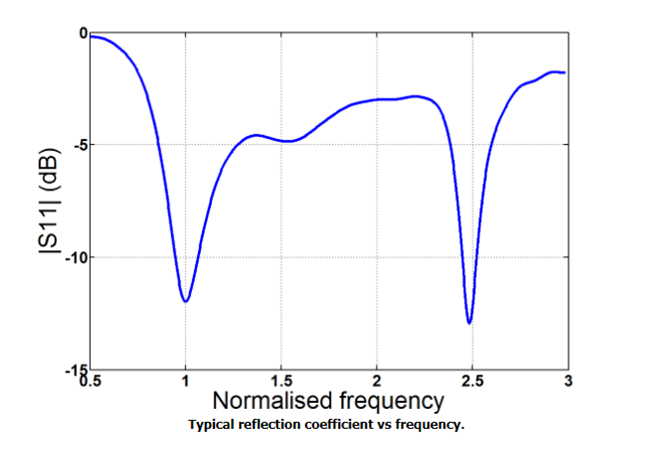 When adjusting either of the resonant frequencies, the impedance at the other resonant frequency will be influenced. Image of the Printed dual band double T monopole. 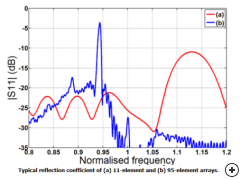 Typical S11 impedance of the Printed dual band double T monopole. 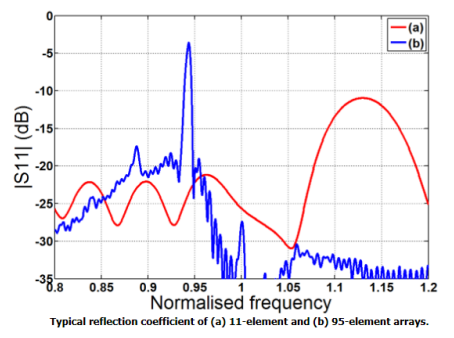 The following figure shows typical radiation patterns at both resonant frequencies. 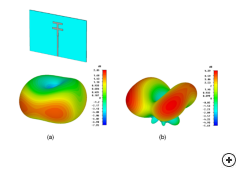 At the lower resonant frequency, the radiation pattern of the antenna is similar to that of a conventional monopole in free space, with a so-called 'doughnut' shape. The radiation pattern at the higher operating frequency becomes more irregular. For both cases, the shape of the ground plane affects the radiation patterns. 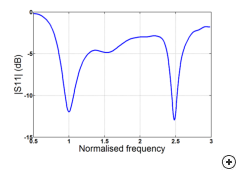 Typical gain pattern at (a) lower frequency and (b) upper frequency. Users can now export all their work in high resolution MS Powerpoint (pptx)format. Users can now export their work as a MS PowerPoint document. The *.pptx file contains everything about the design, like design sketches, parameters and graphs. 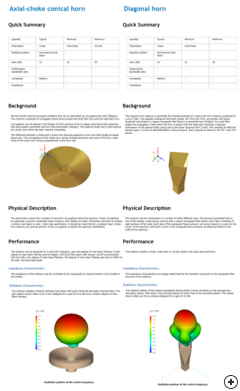 This feature will enable you to put together a presentation about your design work is a few seconds and provide a record of your design in a format other than Antenna Magus. All graph data can also be exported to a tab-separated text format for plotting and comparison outside of Antenna Magus. 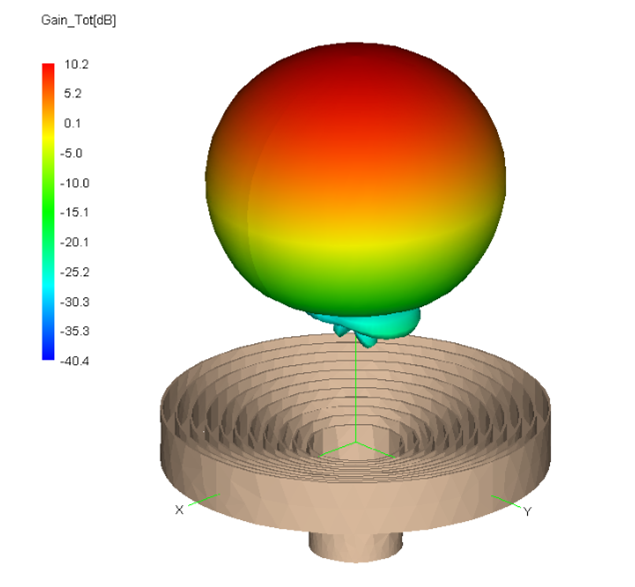 This feature is useful when comparing the Antenna Magus performance estimation to full wave analysis or measurements. The info-browser now has a "side-by-side" compare feature. 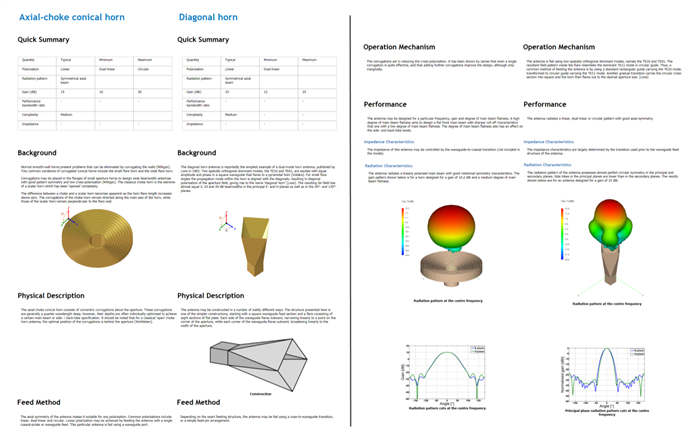 Information documents on any two antennas can be viewed side-by-side for ease of comparison. 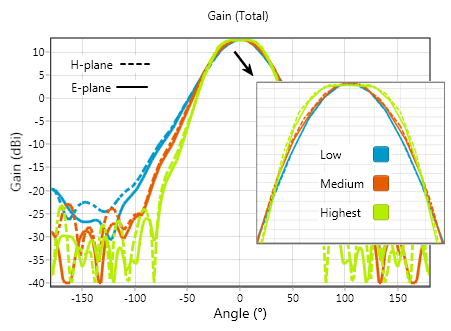 All of the sections of the documents are aligned which makes it easy to compare the different properties of each antenna. We hope that you enjoy using the features in version 2! If you have something that you want to see in a future version of Antenna Magus, please let your reseller know. 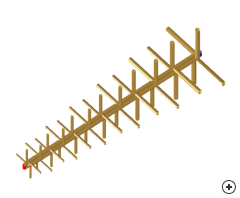 Over the next few months we will be releasing regular updates of our database, with interesting new antennas, new models and updated synthesis algorithms for both antennas and arrays.